FOR IMMEDIATE RELEASE: VIVID AUDIO GIYA SERIES 2 (G1S2, G2S2, G3S2, G4S2) DEVELOPMENT BACK STORY – ALL MODELS SHIPPING NOW! Posted on July 26, 2017 by On a Higher Note. FOR IMMEDIATE RELEASE: JULY 27th 2017 (LOS ANGELES, CA) VIVID AUDIO GIYA SERIES 2 (G1S2, G2S2, G3S2, G4S2) BACK STORY – ALL MODELS SHIPPING NOW! 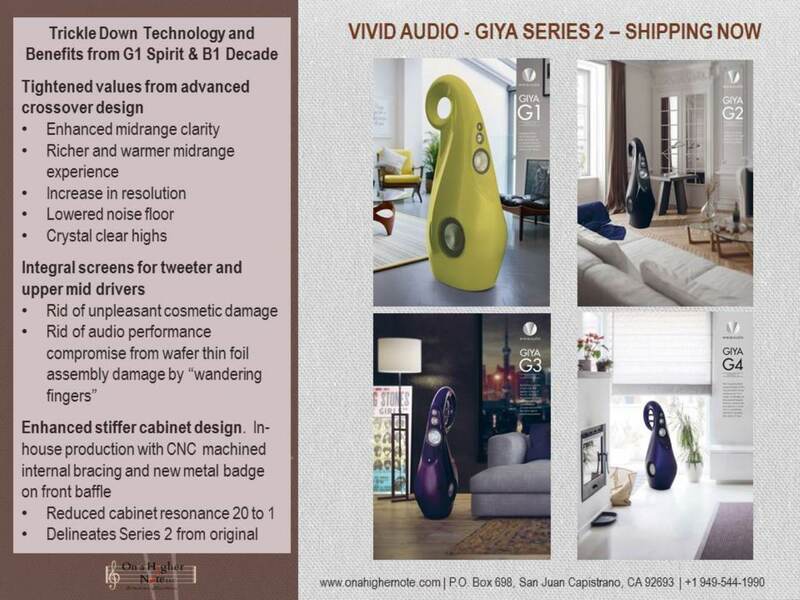 On A Higher Note, a California based premier promoter of musical integrity and distributor of synergistic high end audio components announces the arrival of Vivid Audio’s GIYA Series 2 loudspeakers, the GIYA Series 2 (G1S2, G2S2, G3S2, and G4S2) to replace the original GIYA series (G1, G2, G3 and G4) in the U.S. The path of this long anticipated upgrade of the GIYA series essentially began three years ago when designer Laurence Dickie commenced the redesigning of their B1 loudspeaker to celebrate the 10th anniversary of Vivid Audio. The very noticeable improvements in performance with increased resolution and fuller sounding high frequency and upper mid-range in the 3 1/2 way, 4-driver, B1 Decade, the new flagship for their Oval series almost rivals the original GIYA series. In its continuous quest for perfection, Vivid Audio took the markedly improved mid-base and low-frequency driver and crossover technology to the next level when commencing the redesign of their then flagship GIYA G1 model. Major breakthroughs in crossover designs with an out-board crossover, new low-frequency and mid-bass drivers and cabinet designs for this 4-way, 5-driver GIYA model delivered a new flagship GIYA model, the G1 Spirit, with substantially higher performance and lower resonance than its predecessor. The low frequency driver of the G1 Spirit has twice the area of voice coil with 50% increase in the amount of motor (magnet), which translates to twice the power handling. 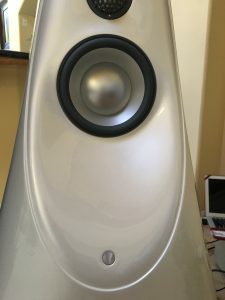 Its mid-bass driver also went through a facelift, with a larger magnet (50% increase in diameter from 50 to 75 mm) now placed adjacent to, instead of behind the voice coil. The inclusion of a carbon fiber stiffening ring into this driver doubled the first breakup frequency. All in all, it is a much more powerful and stronger woofer. With a new external crossover design, the amount of cabinet resonance is reduced by 20 to 1, substantially eliminating the energy that vibrates crossovers inside the original speaker cabinet. The GIYA Series 2 is the amalgamation of three years of redesign, research and development that went into the flagship models of the respective Oval and GIYA series. With trickle down technology from their sibling, GIYA G1 Spirit, GIYA G1S2, G2S2, G3S2, and G4S2 deliver enhanced midrange clarity, richer and a warmer midrange experience and a noticeable increase in high frequency resolution with lower noise floor and crystal clear highs. The new GIYA Series 2 is immediately identifiable with the discreet ½” Vivid logo proudly attached below the midrange woofer’s front baffle. Improved magnetic adhesion for the front and side grilles along with new integral screens for the tweeter and upper mid-range drivers are some functional improvements that Vivid Audio made. These integral screens protect the drivers from audible damage due to “wandering fingers”. Stiffer cabinets with new dual vacuum-infused, stressed-skin design, made in-house further reduce resonance and reflections; allow for a truer musical performance the way the artists originally intended. For more information, visit an authorized dealer near you or visit www.onahighernote.com.